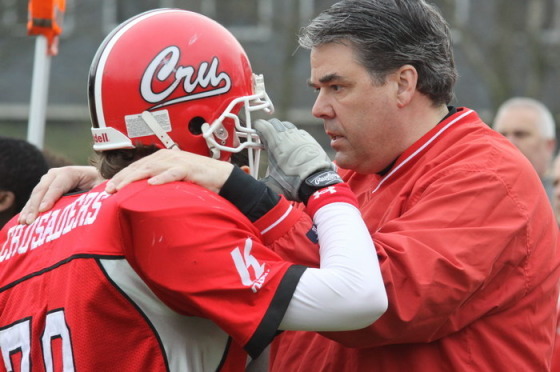 American John Mahnen is a sports marketeer, a Eurosport commentator and helps out at the Dutch-American football association. He has been in the Netherlands half his life. I originally came here for graduate school. I received a master’s degree in International Business Administration from Nyenrode. That’s a really difficult question! I suppose I fit the immigrant model at this point but I don’t rule out a return to the US. Growing up in Toledo, Ohio, I had a hunch I would end up in a bigger city. It just did not turn out to be Chicago! Until the housing market has rebounded, I don’t even need to think about that one! I do speak passable Dutch. I do commentary for Eurosport and the viewers haven’t run me off the air yet! I learned by watching Sesame Street on TV then moved to the news and graduated listening to Radio 1. Ewrtensoep (pea soup). I make my own and I’ve gotten pretty good at it. It’s part of what makes winter so special here in the Netherlands. I miss sports being on TV at reasonable hours. Since I still follow American sports, I sometimes end up watching games after they have been played. I like herring with a jonge borrel, watch the speed skating on TV and complain about the weather with the best of them. On the other hand, I still love making chili, follow the Yankees and I am very involved in American Football – so it would seem I am straddling cultures. I don’t think the Begijnhof is a big secret anymore so I’ll divulge the newest spot most tourists don’t know – the public library! You can have lunch for a very reasonable price at La Place on the 7th floor of the OBA and enjoy a perfect view of the city! I think sports fans are even more committed to their teams than their counterparts in America. What else could explain the fans at NAC Breda who support their team year in, year out without the faintest chance of ever winning the title? Then again, as a Cleveland Browns fan, I can relate. I’d have a look at the Nachtwacht and them make my way through the Leidseplein to the Singel where I’d light a candle in the Krijtberg. Then I would have a broodje halfom nearby the Spui, followed by a beer in ‘t Dokterje in the Rosemboomsteeg and perhaps a kopstootje at Bols before heading off to the Concertgebouw for an evening of music. John Mahnen is a partner in HEG Consult, a business development consultancy, focusing primarily on sports marketing.